The war with Brother Eye is over and Neo-Gotham is the only remaining civilized city with thousands of refugees at its gate. Venturing beyond Neo-Gotham's walls to figure out what remains of Metropolis, Batman runs into The Splicers, a fan-favorite gang from the original Batman Beyond animated series. 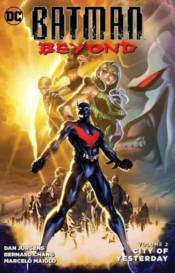 Collects Batman Beyond #7-11.